Every meal I have starts with a salad. 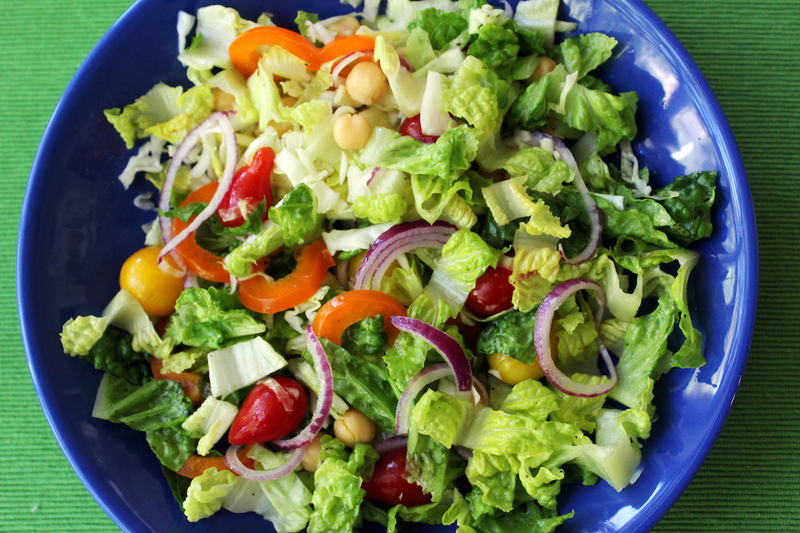 And this is a typical salad that I make every day, full of health-building antioxidants. It’s probably part of the reason I simply never get sick. I have not had a cold or flu in over half a century. Anyone can make a salad, I thought, but I’m sharing a photo of my typical salad to motivate more people to include salads with every meal. It doesn’t have to be this one but eat those vegetables if you want a long and healthy life. People always ask me why I never get sick. How do I get such glowing skin? Am I really seventy years old? It’s because I cook every day and the meal always includes a salad and at least one cooked vegetable. Certain vegetables, like spinach or carrots, have more health benefits when cooked so have both raw and cooked veggies every day. Romaine lettuce is considered the healthiest choice for salads with more nutrients than iceberg, but I sometimes use red leaf or butter lettuce. I always add some cabbage for its many health benefits and colored peppers. A mix of colors will provide the biggest variety of antioxidants so if I use red tomatoes, I use yellow or orange peppers. If I use yellow tomatoes, then red peppers. Red onions add a nice kick but that’s not why I add them. Onions and garlic a loaded with immune-boosting elements. Garbanzo beans add fiber and calcium but I sometimes use red kidney beans. Romaine Lettuce contains lutein for protect against vision loss, fiber, vitamins A, C, K, and folic acid. Green Cabbage can protect against cancer & heart disease and boost your immune system. Bell Peppers have more vitamin C than oranges and they support eye and lung health. Red peppers have more vitamins A and C than green. Tomatoes can protect against heart disease as well as breast and prostate cancer. Garbanzo beans are full of protein, fiber, magnesium, potassium, and iron. Red onions help strengthen collagen, support bone health, prevents cell damage, and supports a strong immune system. 12 Comments on "Eat a Salad Every Day"
I forgot to mention in my comment on eggs , I always watched your talk show , a few years ago , I am 79 years old , today I wish you could go back on and show the right way to have a show , I miss the old way . Thank you for all you do . Thank you for remembering me and my show. Your salad idea is great. I have to tell you, your web site is the Very Best. When I watch your videos I feel like we are together in your kitchen. You are so knowledgeable and so much fun. I love your recipes they are so real and most items are in an ordinary pantry. I have read and watched so many different sites but I can not delete them all now that I have found you. I love salads. Never tried red leaf or butter lettuce. I’ve mostly eaten iceberg until my sister told me it’s mostly made of water. She said romaine is better for you, so now I will have to let her know about the other ones you mentioned. I love veggies raw or cooked. Steamed veggies are okay but roasted veggies are really good. I didn’t eat roasted veggies much at all until I started following your recipes online, but my favorite is roasted brussels spouts,…omg, yummy!…I love your olive oil and lime juice dressing for your spicy slaw recipe. I will try your dressing for salads next time. One more thing, can the dressing be made and then stored for the next salad? Btw, no matter how small your recipe is like this salad you’ve posted is. I’m sure others like the info you bring to it. I know I do. It will help others know the benefits and be more informed, I think, so thank you…. Yes. I make my dressing by the jar and keep it for weeks but olive oil solidifies when refrigerated so you need to remember to take it out of the fridge to let it warm up. I’ve never made dressing ahead of time, but I usually always make my own with olive oil, vinegar, oregano, etc.. Thanks for the jar tip…I never thought of it, but it would be easier to make the dressing mixture and then put it in a jar for future purpose. Thanks! Hello Jenny, thankyou so much for another delicious recipe. I am definitately putting these ingredients on my shopping list right now. You really inspire me to take better care of myself and my husband through food and it is so kind of you to share this with all of us. I really appreciate it as I am sure do all your other followers.